Satellite watchers are gearing up for UARS coming down – attempting to chart where the spacecraft will re-enter. Tomorrow appears to be re-entry day for NASA’s Upper Atmosphere Research Satellite (UARS) — a school-bus size spacecraft that will shoot its way into Earth’s atmosphere. NASA, the U.S. military and amateur astronomers have been refining their predictions of the spacecraft's fall, and are now able to say it won't come down over North America. In an early Thursday update, NASA posted that the Earth-circling orbit of UARS was 115 miles by 120 miles (185 km by 195 km). Re-entry is expected sometime during the afternoon of Sept. 23, Eastern Daylight Time, the posting explained. Updates on the whereabouts and predicted demise of the 6 1/2-ton UARS come from the Joint Space Operations Center of U.S. Strategic Command at Vandenberg Air Force Base, Calif.
Ted Molczan, a Toronto-based leader of a global network of satellite-tracking sleuths, told SPACE.com that it’s tough to come together on the actual re-entry spot for UARS. He’s been busy using United States Strategic Command (USSTRATCOM) orbital elements to plot the end of UARS. That’s the case for skywatcher and satellite re-entry analyst, Harro Zimmer of Berlin. 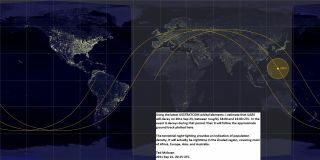 He has also used software and available satellite tracking data to crank out his predictive solution, showing UARS descending over 0.2°S, 140.1° E, which is in the South Pacific, north of New Guinea. The end of life for UARS is getting lots of attention. One key reason is that while the spacecraft will likely burst into pieces during re-entry, not all of it will burn up in the atmosphere. Items expected to make it through the fiery fall include a high-gain antenna gimbal, fuel tanks, batteries and reaction wheel rims. The surviving pieces add up to 26 components, yielding a total impacting mass of more than 530 kilograms. Because the satellite’s orbit is inclined 57 degrees to the equator, any surviving components of UARS will land within a zone between 57 degrees north latitude and 57 degrees south latitude. It’s impossible to pinpoint just where in that zone UARS leftovers will hit. NASA re-entry experts estimate that the debris footprint will be about 500 miles (800 km) long. NASA’s UARS satellite was deployed in Earth orbit by a space shuttle crew in 1991. It was the first multi-instrumented satellite to observe numerous chemical constituents of the atmosphere with the goal of better understanding atmospheric photochemistry and transport.